Boston, April 18th, 2019 – International animal welfare organization FOUR PAWS is fighting to retrieve three lions from unsuitable conditions in Albania. The lions had been rescued from the neglected Safari Park Zoo in Fier, Albania, previously deemed “Europe’s Worst Zoo,” and have been temporarily accommodated in the Tirana Zoo since October of 2018. Now Albanian authorities are blocking the transfer of the animals to a specialized facility operated by FOUR PAWS in the Netherlands, citing an ongoing lawsuit for damage to property initiated by the former owner of the animals. However, the lions play no part in the lawsuit. FOUR PAWS was already allowed to transfer a three- legged bear, rescued from the same mission as the lions, to the organization’s German sanctuary at the beginning of April. In an attempt to save the three remaining lions, FOUR PAWS has initiated a protest against those responsible in the Albanian government. "It is inexplicable to us why we cannot relocate lions Lenci, Bobby and Zhaku. The Albanian authorities cite a court case as the reason, but we know the lions are not the subject of this case. The animals have nothing to do with it. Otherwise we wouldn't have been able to bring bear Dushi to our bear sanctuary in Germany,” says Ioana Dungler, Director of the Wild Animals Department at FOUR PAWS and leader of the Safari Park Zoo rescue last year." Ioana Dungler, Director of the Wild Animals Department at FOUR PAWS and leader of the Safari Park Zoo rescue last year. Photos of the Safari Park Zoo animals had circulated across the globe and sparked international outrage. One image showed a lion with a severely infected eye and photos revealed many other emaciated animals. The images supported the media’s nicknames for the zoo, which they called “Europe’s Worst Zoo” and the “Zoo from Hell.” The Albanian Ministry of Environment and Tourism decided to confiscate all wild animals and FOUR PAWS supported the authorities in their endeavours. 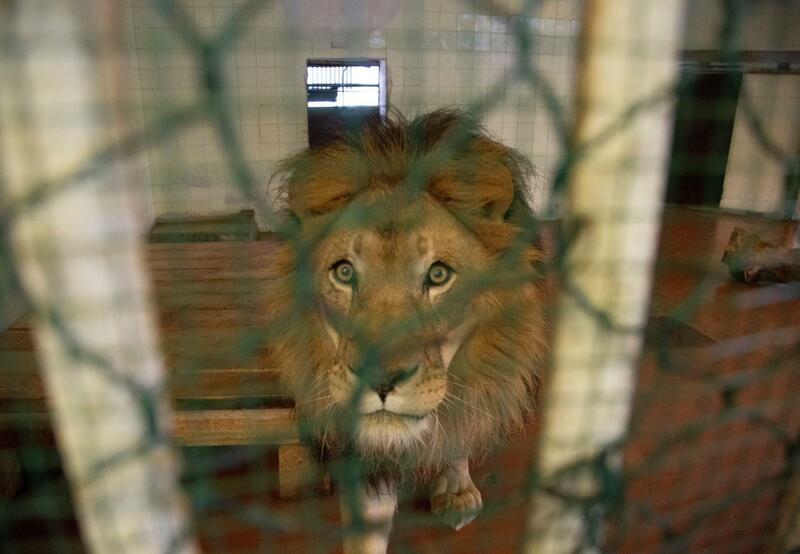 In October, FOUR PAWS intervened to save 10 wild animals from the Safari Park Zoo. Veterinarians were able to provide medical first aid. “We were happy to have had the support of the Albanian government during our original rescue and relocation of the animals, but now the government is unnecessarily prolonging the suffering of these innocent beings,” claims Robert Ware, Executive Director of FOUR PAWS USA. The Albanian Ministry of Environment and Tourism and FOUR PAWS originally agreed the lions would be transferred to FOUR PAWS’ Big Cat Centre FELIDA in the Netherlands. There, the lions can receive urgent medical care and attention. However, the Albanian government has thwarted this plan. All negotiations to date with Albanian authorities have not led to a concrete outcome. Again and again the departure date has been postponed and the latest date FOUR PAWS has been given for their final rescue and transfer is September. This is clearly too late. “Our patience has come to an end. The lions are only suffering because of bureaucratic arbitrariness. We can offer them a species-appropriate life now. We expect the Albanian government to be a reliable partner and we hope they will respect their commitments made for these animals,” says Dungler. The rescued animals that had been brought to Tirana Zoo were only supposed to stay there as a stopover until their final journey to FOUR PAWS’ sanctuaries was clarified. On April 3rd, Dushi was allowed to leave and given her chance at a new life. But the lions are deprived of the same opportunity. “Although we are grateful for the support of Tirana Zoo, the enclosures are not ideal for an extended stay for the lions. They are way too small and only have concrete floors. The animals have no possibility to go outside and they are locked up in a confined space all day. We are seriously concerned the lions will develop severe behavioural problems,” explains Dungler. “FOUR PAWS has been tirelessly campaigning for the departure of the lions. When the lions are finally released into our custody, we will be able to provide the best treatment possible. Our specialized team has successfully recuperated other traumatized wild animals and we are confident we can help improve the lives of Bobby, Lenci and Zhaku. We ask for as much public support as possible to help put pressure on the Albanian government to do the right thing and allow these innocent beings to have a new life and finally… peace,” states Ware. On fur farms, wild animals spend their entire lives in wire mesh cages, deprived of the ability to engage in natural behaviors, only to be killed cruelly. In the wild, animals can be held captive in traps for days without food or water until trappers come to retrieve them. In the meantime, they often gnaw off their own limbs in a desperate attempt to escape. Once on the fur farm, they are plagued by illness, uncleanly keeping conditions, stress and overcrowding. The Fur Free Alliance is a coalition made up of more than 40 animal protection organizations from over 30 countries working to end the fur trade. The alliance also runs the Fur Free Retailer Program, which celebrates more than 900 fur-free companies worldwide and helped announce fur-free policies for Gucci, HUGO BOSS, Armani and many others. FOUR PAWS is a proud and active member of the ground-breaking alliance but also was founded through fighting this particular cruelty. FOUR PAWS has worked to end the fur trade for decades, lobbying to end fur farming across Europe, pushing for labelling laws in European countries, pressuring companies to find fur alternatives, and educated the public on consumer choices. To most of these there have been large and small victories but plenty more to be done while millions of animals are killed each year for their fur. FOUR PAWS is encouraing everyone to join in by calling or emailing Prada and asking them to adopt a fur- free policy and help build this movement! (http://bit.ly/pradafurfree).